The Balkans, strategically situated in southeastern Europe, were called the powder keg of Europe and were devastated during the First and Second World Wars. 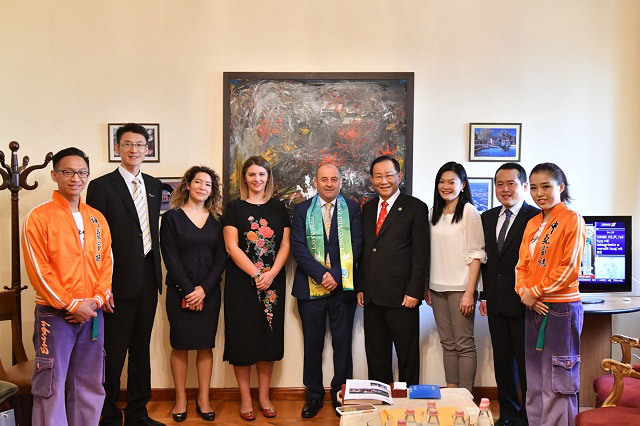 In October 2018, Dr. Hong, Tao-Tze, President of the Federation of World Peace and Love (FOWPAL), led the FOWPAL delegation to conduct cultural exchange trip of peace on the Balkan Peninsula. On October 15, they arrived in Albania, the 85th nation that FOWPAL traveled to, and visited the Parliament of Albania. On behalf of the speaker of the Parliament, Prof. Kosta Barjaba, Senior Advisor to the Speaker, extended a warm welcome to the delegation and said that 85 is a lucky number. Dr. Hong, Tao-Tze shared with Professor Barjaba the achievements of FOWPAL’s promotion of love and peace over the past year. Dr. Hong especially shared the movement of An Era of Conscience, with participation from 197 nations, which has been co-organized by FOWPAL. H.E. Mr. Rexhep Meidani, former President of Albania, joined the movement and endorsed the Declaration for the Movement of An Era of Conscience in 2014. The last nation in Eastern Europe to abandon communist dictatorship, Albania had been isolated from much of the international community for decades. Starting in 1991, the Albanian government initiated a series of political and economic reforms: A multi-party system was introduced, it adopted some free-market measures for the economy, its citizens restored religious freedom, and its press started to flourish. In the transition process, it faced a financial crisis, refugee issues, war, and other challenges. Now Albania is actively involved in the international community. It became a full member of the North Atlantic Treaty Organization in 2009 and has been an official candidate for accession to the European Union since 2014. It is also a member state of the Organization of the Black Sea Economic Cooperation (BSEC), and H.E. Mr. Gramoz Ruçi, the Speaker of the Parliament of Albania, is the President of the Parliamentary Assembly of the Black Sea Economic Cooperation, the parliamentary dimension of BSEC, and plays a significant role in enhancing Albania’s economy. Prof. Kosta Barjaba, on behalf of the speaker of the Parliament, and Dr. Hong, Tao-Tze had an insightful conversation. Dr. Hong emphasized that a good culture nurtures quality education, which leads to a sound economy, which is essential to peace. Dr. Hong also highlighted the importance of human rights in the promotion of peace. Professor Barjaba stated that a healthy economy is the foundation of a democracy because democracy won’t work if people’s basic survival needs are not met. The people of Albania aspire to peace and hope that their country will be free of war, added Professor Barjaba. An international peace organization established in California in 2000, FOWPAL aims to promote world peace and advocates the notion that thinking kind thoughts will improve the world. With members spanning 95 nations, FOWPAL has been spreading love and peace worldwide through hosting World Summits of Love and Peace, holding ceremonies of ringing the Bell of World Peace and Love, and conducting cultural exchanges. 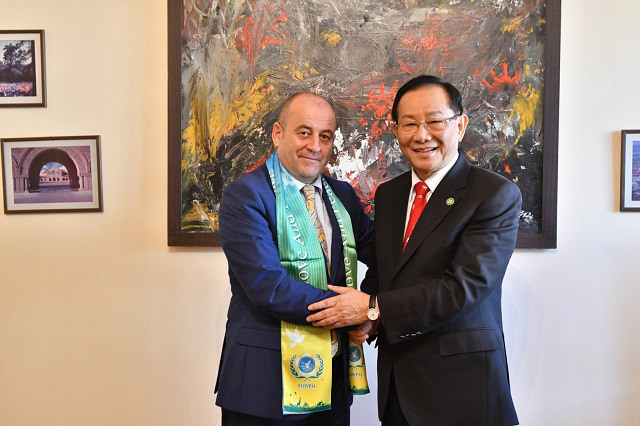 Over the past nearly two decades, FOWPAL has urged leaders in all fields to exert their positive influences and carry out their wishes for world peace, and it was instrumental in defusing conflicts in South America and Africa. Professor Barjaba watched a video attentively featuring the highlights of FOWPAL’s journeys of peace around the globe. When he saw visionary leaders making the hand gesture of “dove” in the video, he indicated that the gesture bears a resemblance to the eagle on the national flag of Albania. Professor Barjaba and his colleagues were happy about this discovery and expressed that Albania, the “Land of Eagles,” is a peace-loving country. They took a group photo with Dr. Hong, Tao-Tze and FOWPAL delegates and conveyed their willingness to work together for love and peace. The 17th International Conference of Chief Justices of the World was held in Lucknow, India, on November 12-15, 2016. Dr. Hong was invited to attend the meeting, and he shared the philosophy of yin and yang at an exclusive interview with an Indian media group. The World Summit of Love and Peace was held in Gyeongju, Korea on May 30, 2016, with NGO delegates from 40 nations in attendance. In response to the 17 Sustainable Development Goals adopted by the United Nations, the Declaration of World Citizens was shared with the attendees to ignite the light of hope across the Earth. UN Secretary-General Ban Ki-moon attended the Rio+20 and cheerfully waved to FOWPAL members.